Thermometers that tell the temperature by measuring radiation from an object are called infrared thermometers. These thermometers have a lens that focuses the infrared energy on to a device that converts it into an electrical signal and passes it on to a display panel, which has been calibrated to show the measurement in temperature units. Key advantage of such thermometers is their ability to measure temperature without coming in contact with the object, as radiation energy can be measured from a distance. This is particularly useful in situations where it may not be possible to measure temperature using conduction techniques, such as in industrial applications with very high temperatures or in complex mechanical assemblies with no direct accessibility. Infrared thermometers can help assess the quality of insulation in construction works such as walls, pipes and windows. They can also be used to ascertain room temperatures or thermostat settings in heating and cooling systems. In greenhouses and outdoor gardens, they may be used to inspect the soil temperatures. In the kitchen, infrared thermometers can be used to check pantry, refrigerator and freezer temperatures. While cooking food, they can be used for verification of cooking and serving temperatures as well. Another use of these thermometers can be to accurately measure temperatures during preparation and storage stages of wine and beer making, as these processes are temperature sensitive. Infrared thermometers can also be useful while inspecting problems in household electrical or mechanical appliances. By measuring temperatures of typical heating points and ascertaining abnormal sources of heating, a quick diagnosis can be made. Infrared thermometers can also find uses in pursuing hobbies such as photography, as developing of prints requires a control over the ambiance temperature. Engine and exhaust troubleshooting in automobiles can be effectively carried out using infrared thermometers. For instance, low compression and ignition problems can be identified by scanning the manifold temperature. Incorrect fuel/air mixture leads to inefficient combustion, which can be determined by measuring the temperature of exhaust system components. Diagnostics of cooling systems, radiators, climate control sensors and other devices that operate on temperature gradient can be carried out using infrared thermometers. Similarly, in brake system of automobiles, very high temperatures of rotors, drums or bearings indicate excessive wear and can be measured using an infrared thermometer. In electrical devices and components such as connectors, motors, bearings, transformers and batteries, any abnormal heating is indicative of malfunctioning. 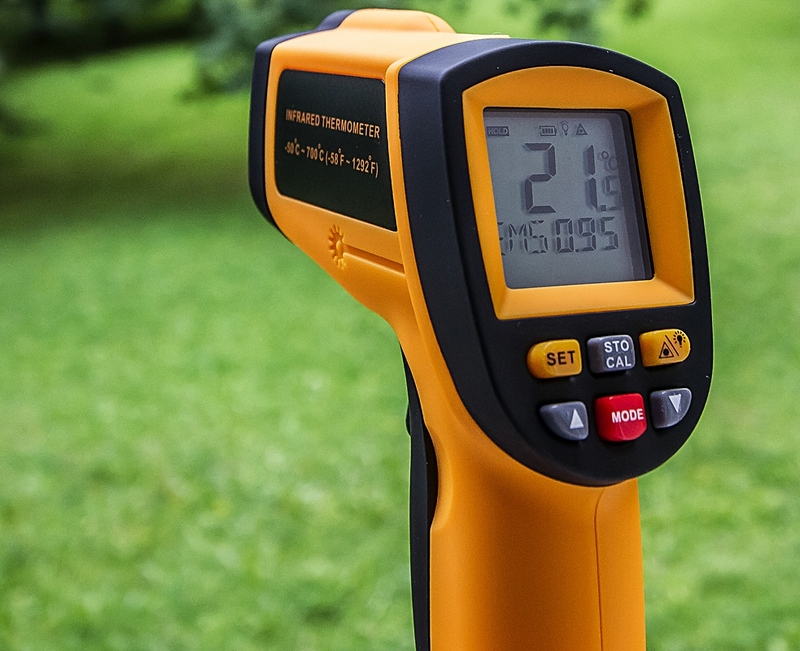 Since infrared thermometers measure the surface temperature of an object from a distance, they can be extremely useful in preventive maintenance operations, while also ensuring that they are carried out in a safe manner.